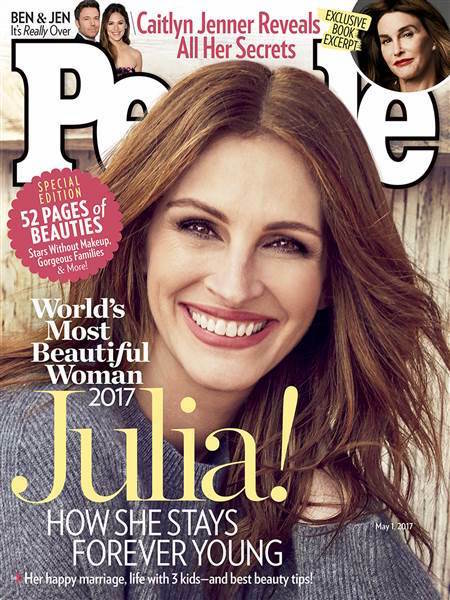 The internet exploded when Julia Roberts was revealed to be People Magazine’s choice for WORLD’S MOST BEAUTIFUL WOMAN 2017. Not a lot of people said bad things about Julia, but many questioned the choice of a 49 year old five time winner – they wanted a new face. The REAL question is, of course, why is People magazine living in the last century with this archaic sort of “contest!” BEAUTY CONTESTS are WAY past their date of expiration. Even People’s male version is called “Sexiest Man Alive” which implies more than just superficial looks. We’re betting People’s editor is just another oblivious MAN… who thinks he’s doing females a favor by selecting a mature woman. Here’s hoping this is the last year they repeat this nonsense. The Fate of the Furious is expected to haul in the big bucks again this weekend, but we are WAY more motivated to watch Katherine Heigl play mind games with Rosario Dawson in “Unforgettable” – which was directed by a WOMAN, by the way, –Denise Di Novi. Heigl seems ideally cast as the perfectly groomed Stepford-ish ex-wife, consumed by jealousy of her ex-husband’s free-spirited new fiancée played by Rosario, of course. Women are the main characters and the men are just incidental in this film – just of opposite of Hollywood’s usual fare.